Home Small Business Success for Any Business is Great Customer Experience. Period! The best athletes and sportspersons in the world take calculated but bold risks in order to stay ahead of the competition. Take the recent example of Usain Bolt. The world’s fastest man is a powerful reminder of how to take the lead in difficult and demanding situations. He is a fierce competitor when it comes to competing different athletics event around in the world in harsh and unfriendly conditions. Just his Olympics medals are a reminder of what a great athlete he is. We can learn a lot from Bolt’s life as an athlete and one aspect that is among the most important is how to lead in an uncertain scenario. Just like him, companies must also make bold bets and steps to make a great customer experience the catalyst for their success. It’s the best way to succeed in business and customers also agree on this. According to a McKinsey study, 70% of buying experiences are based on how the customer feels they are being treated. Customers long for an amazing shopping experience but most often than not they are left disappointed. For a business, the customers’ interaction with your brand is what makes a great customer experience. Everything from going to a website, visiting a store physically and interacting with the sales staff is included as customer experience. So the customer experience in a posh, upmarket restaurant having a steak is different when he look for a steak at a restaurant located besides a gas station. According to a recent Accenture survey, only 23% of the companies were able to deliver great customer experiences. The other 77% were simply not up to the task. That’s why it is critical for a business that claim to provide a rich shopping experience to its customers but in essence they provide poor service. Together, the marketing gurus and customer support executives at Apple, Ferrari and Starbucks are able to provide among the best experiences a customer can have. The all-important questions is, why customer experience so important. The way a company treats its customers define who they really are. It’s an important part of the promise a company makes to is customers. The customer experience is the key to success for any venture. Let me show you why as the following 5 points will describe this aspect. If you own a small business or startup, I think by now it is clear to you how hard it is thrive in the market. If you are working in a crowded marketplace, one thing is evident; the demand exists for your product and your market is viable. Most of the companies will offer products or services very similar to you. So how you can compete in this scenario? Competing on price would be difficult as you are a small time player in the market so you need to compete on customer experience. Latest data from Gartner show that 89% of companies now expect to compete on the basis of customer experience. Compare that to only 36% just 5 years ago and this means you have got a real chance to compete against even the biggest player in the market. Create a customer experience that will make you unique and shine like no other. It’s not about what you are selling but how. Companies don’t just have to follow the latest trend to focus on customer experience. Making each customer interaction amazing don’t just make your customers adore you but rather they will be willing to pay more for the experience. Surveys have shown that a whopping 86% of customers are willing to pay more for a better customer experience. How much more is the next logical question you must be thinking after the last sentence. Well, that’s why American Express conducted a survey of its customers and found out that customers who valued good service were willing to pay up to 12% more for a product if accompanied by excellent customer service. This figure showed an impressive 50% increase from the extra amount people would pay the previous year! So it’s a vital aspect for businesses to consider. Most businesses spend handsome amount on trying to lure potential customers. It’s a long and expensive process to finally persuade a prospective customer to buy your product. Studies show that it’s 6-7 times more costly to attract a new customer tan it is to retain an existing customer. So it’s strange that most companies little or no money to retain their current customers. Companies tend to take their customers for granted and that’s why they make no effort in retaining them that finally results in customers choosing a product from your rival firm saying goodbye to you forever. The US Small Business Administration reports that 68% of customers don’t come back because of poor treatment they get from a company. More worrying aspect is found in this study; according to a Bain & Company study, 60-80% of customers who describe themselves as satisfied with a company still do not become repeat customers. Reason is simple: they didn’t get the customers experience they were looking for as mostly companies don’t try to build a personal connection with their customers. Word of mouth is the best advertising that can get companies a number of new customers. Devoted customers of a brand can give it the much needed positive advertisement for free by referring it to everyone in their social circle. In fact, American Express found that, on average, happy customers tell nine people about their experiences about a company. Just 3% of people go for a new product even after seeing a great advertisement. On the other hand, 42% of people try a new product if it is recommended by anyone they know. Word of mouth is actually the trust we have on our friends, colleagues, etc. And that’s where companies can cash on big time. That’s why focusing on resources to make your current customers happy is much less expensive than spending money on potential customers. A study by InfoQuest found that a “totally satisfied customer” contributes 2.6 times as much revenue to the company as a “somewhat satisfied customer.” So it’s basically all about increasing your customer lifetime value (CLV). For example, if you have a cost per acquisition of $100/customer and a CLV of $150, it means a 50% ROI on your marketing. Now imagine you can double your CLV to $300. Offering amazing customer experiences will help you build long-term relationships with your customer. Customer experiences that invoke shared values are particularly powerful with 64% of participants in a study saying that shared values were their primary reason for their loyalty to chosen brand. By offering experiences that appeal to your customer’s core beliefs, you can build this loyalty over time. So you want to deliver outstanding customer experiences? Needless to say that you must be accessible and responsive when dealing with customers. But that’s what you are expected if you are offering a product to a customer. You need more than that to deliver an outstanding customer experience. 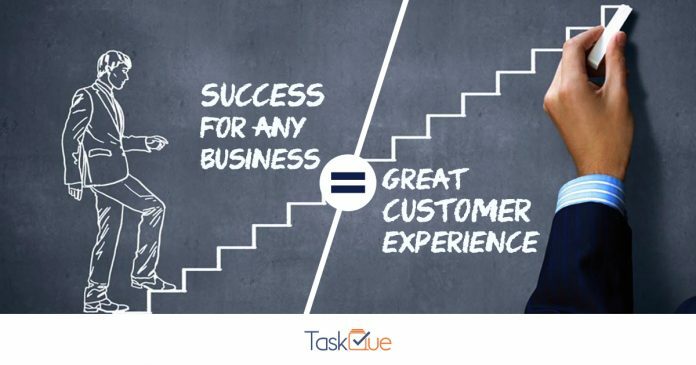 To achieve this feat, you need to go beyond your customer’s’ expectations. You need to offer your customers outstanding experience each time they deal with you. Make your customers feel about you the same way they feel about their friends for a great and lasting relationship with them.